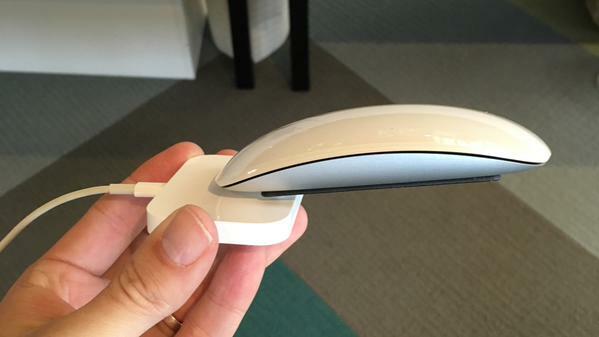 Looking for an awkward way to charge your brand new Magic Mouse 2? Why not use an iPhone dock! Apple unleashed its new Lightning-enabled Magic Mouse earlier this week, featuring a lighter and sturdier form factor, as well as improved “foot design” for a smoother glide. Despite the fact that it only takes 120 seconds to get a whole day’s worth of charge, a number of users have already criticized Apple for putting the charging port on the underside, with some even calling for the head of whoever designed it. This entry was posted in MacBiz and tagged Apple chargers, Apple peripherals, iphone docks, iPhone Lightning Dock, Lightning charger, Magic Mouse 2. Bookmark the permalink.